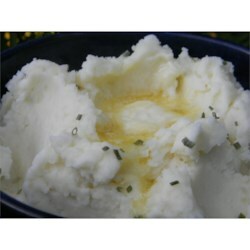 "This is a simple twist on the age old, yet plain old, mashed potatoes." Fold in the cream cheese and mash with a potato masher or beat with an electric mixer until smooth. Add the butter and cover with potatoes; once softened, stir to mix. Excellent. Might mix in a little milk also, to make more creamy, and some salt and pepper to taste of course. Sometimes food just doesn't have to be healthy, so lighten up ISSA. Of course these are going to be delicious. After all, they DO have four sticks of butter in them! Perhaps a more accurate name would be Cholesterol Casserole?!?! I love the cream cheese twist. I did put less butter. Thanks for the formula. Quite tasty, if I do say so, myself. I sort of 1/4'd the recipe and added milk. Less butter and more cream cheese. I do love good mashed potatoes. Awesome! This was creamy yummy goodness.